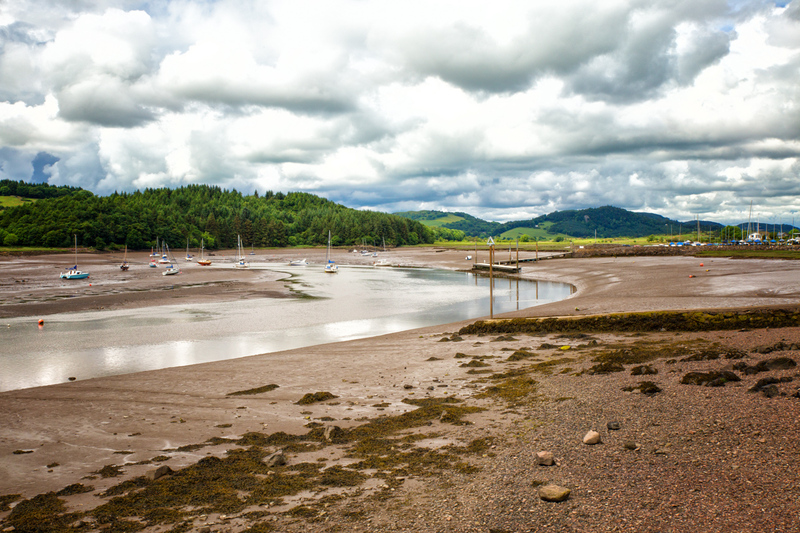 The weather at Kippford was very sultry and far too warm and muggy for comfort. Mr L’s health problems were not aided by the weather and he was feeling pretty much awful all of the time but he refused to let this get in the way. 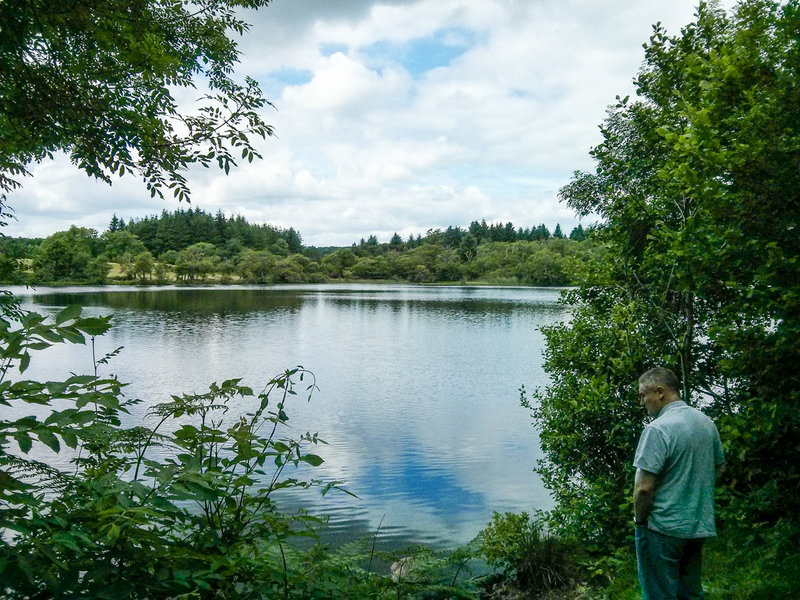 Once his tummy had settled on Sunday we set off to walk to Dalbeattie, this being one important part of our research. We will not have a car when we go off with the RV and we need to know how feasible it is to walk or use public transport in order to keep ourselves fed. There is a small shop on the site but it is very poorly stocked and only open during the summer season. The side gate to the site opens onto a B road, with the golf course across and a short stroll, only metres in fact, down to the A710. Across this main road is Dalbeattie Forest, full of cycle paths and walks. 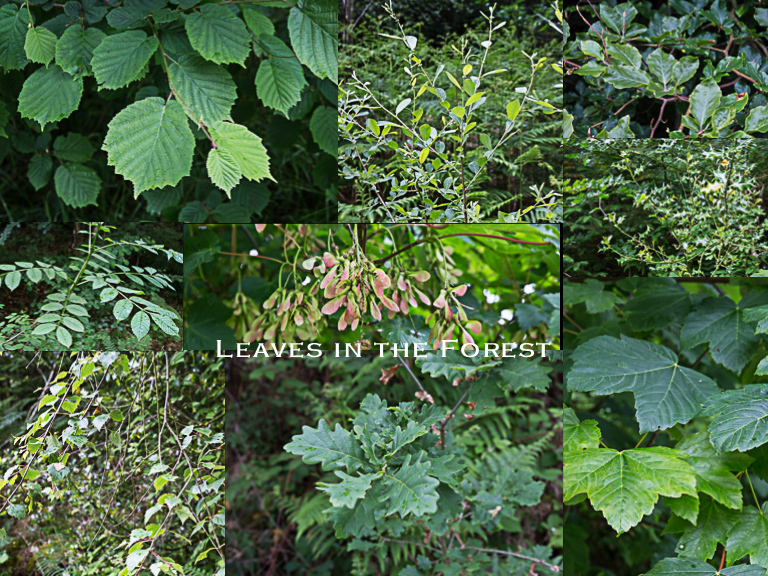 Dalbeattie Forest is a mixed planting with many young deciduous trees. It has wild flowers, butterflies, red squirrels and much birdlife; it is very unlike the sterile Northern forestry. It was in short an absolute delight and offered many opportunities for 30 Days Wild photos. You do need your wits about you as mountain bikers doing the 7 Stanes are apt to hurtle from the undergrowth at unexpected moments. There were midges, though not many and we only had trouble in two spots over our three days, both when seated for a while near long grass. It was hot, it was muggy, it was not all that pleasant at times. 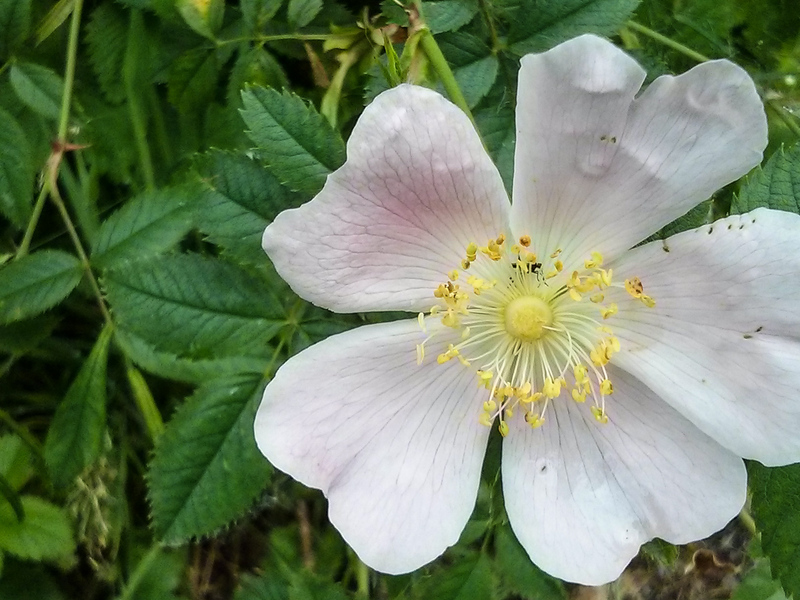 I soon regretted taking my camera with me – not only was it very heavy to be carrying but I seemed to have entirely the wrong lens with me, whether I was attempting wildlife or landscape. We walked and we walked and Nell was having a great time, though I was wishing that we had brought more water with us. Eventually we reached Dalbeattie Loch, covered in waterlilies but a bit too midgie to stop and photograph. 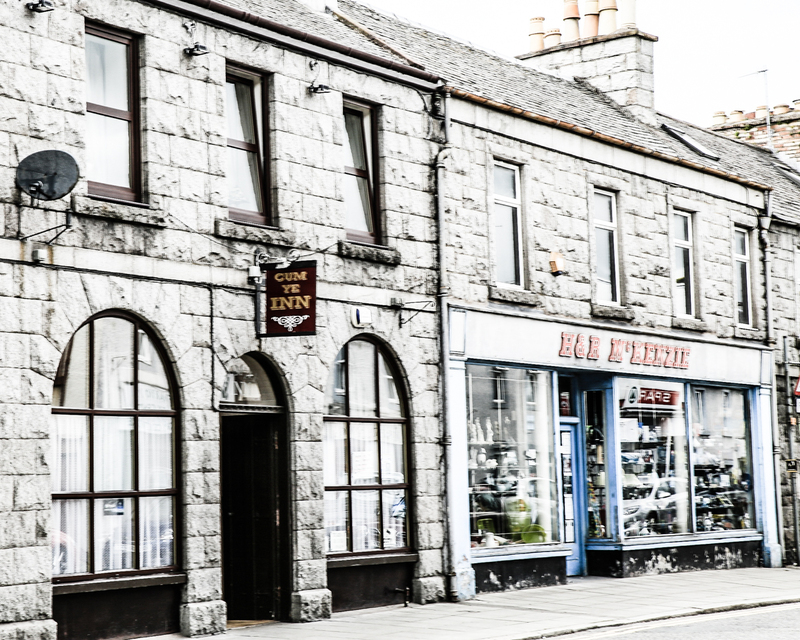 We walked on through Dalbeattie Town Wood and emerged onto the high street. Unfortunately it was way too hot for us out there in the sun and neither of us felt much like exploring the town, so we skedaddled back into the wood for a light lunch of fresh cherries and plain water and wished that we had packed a proper lunch. It was while we were sitting there on a mossy rock that I recalled the Pedometer app on my phone. I switched it on. When we arrived home it transpired that we had done over ten miles. It was a good walk, on a less sticky day it would have been a pleasant one. However, for future reference, we are unlikely to walk both ways just to go pick up supplies. We would either cycle both ways or walk in and bus back. Teddy, normally one to enjoy as much warmth as possible seemed to be suffering from the heat too. 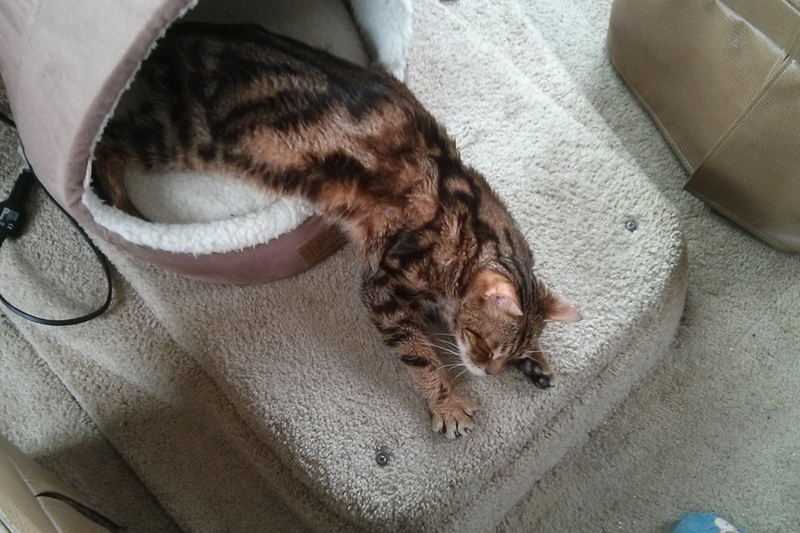 He had stopped demanding feeding every half hour and seemed unable to decide whether to linger in his bed or no. There had been earlier debate about whether or not to fit in a nostalgic walk up Screel but my body was screaming for mercy by the end of Sunday and not feeling a great deal better on Monday morning. Mr L was still feeling very poor, and Teddy was positively listless. We decided to take the day slowly. We also decided to book an extra night as we were enjoying the area so much and abandon our plans to go into the Galloway Forest for a spot of wilding. It was a sound decision, giving us more time for research and an extra day to stage our journey home. As Mr L went ever downhill, I was pleased that he had fewer miles to drive. 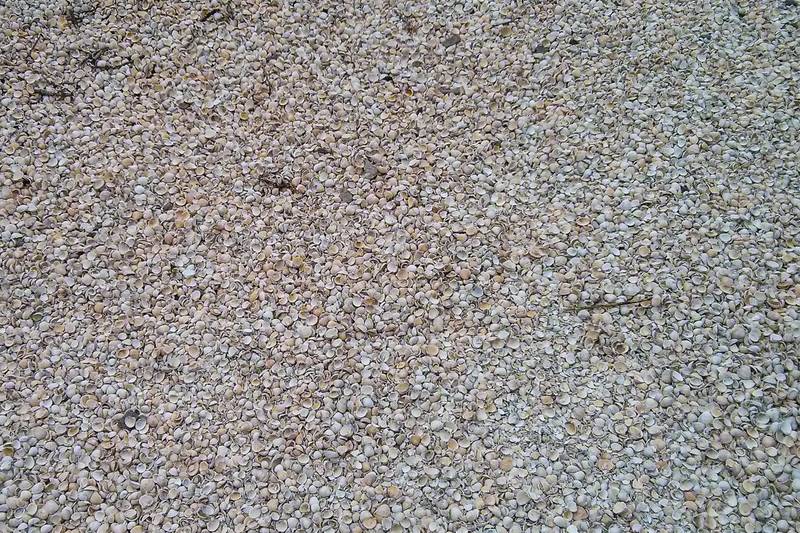 Mr L spent some time looking at the entry step on the RV, which he had accidentally bent on Saturday when we arrived. I’ll spare his blushes and all the details. I did the laundry while he was doing that and then we went to initiate discussions on booking a seasonal pitch for the winter. 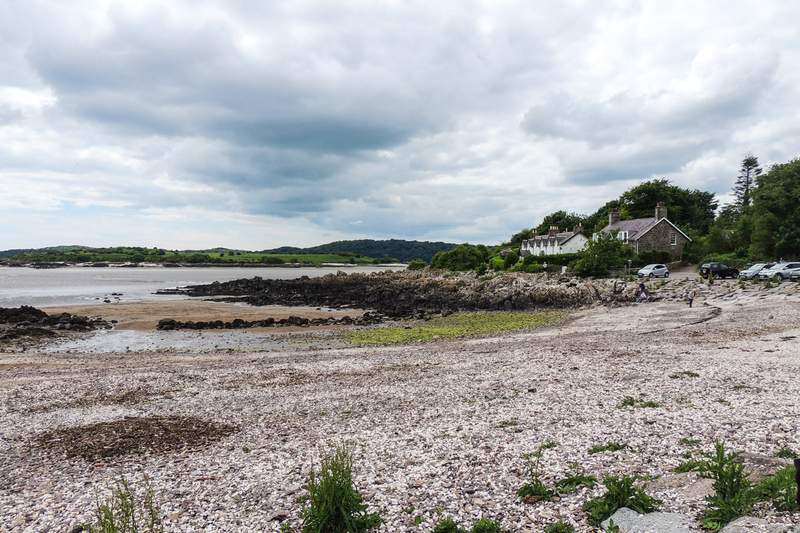 Then we took a leisurely walk into Kippford to try out the pub lunches (an essential element of our research, this) , going up the site to the wood at the top, then through the woods to emerge at the far end of the village. We came home via the road, a far shorter but less interesting route. It was Nell’s very first pub outing. She was uncertain, until a second Border Collie turned up and then she wanted to mingle. The newcomer was wearing a muzzle so we thought it best not to give Nell her head. The beer was good. The Panini not too bad at all. The little Robin stealing food from the plates all around was a delight but far too fleet to be captured on the phone camera that I had with me. Nell found her very own boat! Some R&R followed before we had an afternoon dog walk back in Dalbeattie Forest. Just a brief amble, about a mile out towards Colvend and a mile back again. I spent the time gathering some leaf photographs for a 30 Days Wild project effort. By now all that I could do was to “show willing” as all the walking and the heat had really got to me. I was unnerved by the plan to go back to Kippford for dinner and then walk home again! We caught the last bus into Kippford (further essential research) and I wielded my oldies pass for a free ride. Mr L had a free ride too, despite his extreme youth. Dinner was so-so. I have no burning ambition to return for more. That will make life cheaper, I suppose. Over dinner I came to a conclusion regarding the christening of the van. It’s not a girl. It’s definitely a big bloke. A real redneck. Hank, the Yank. Teddy stayed in his own bed again. I was appreciating that but it did worry me. Worse was the fact that by now we were having to buy fresh salmon in order to tempt him to eat anything at all. Tuesday saw the walking boots on again. This time I wisely left the heavy Canon at home and opted for my walking poles instead. It was the sensible decision but there were several occasions when I was frustrated by the lack of the good camera. Once again we had to wait for Mr L’s tummy to settle before we could leave home, so it was quite late when we got off. 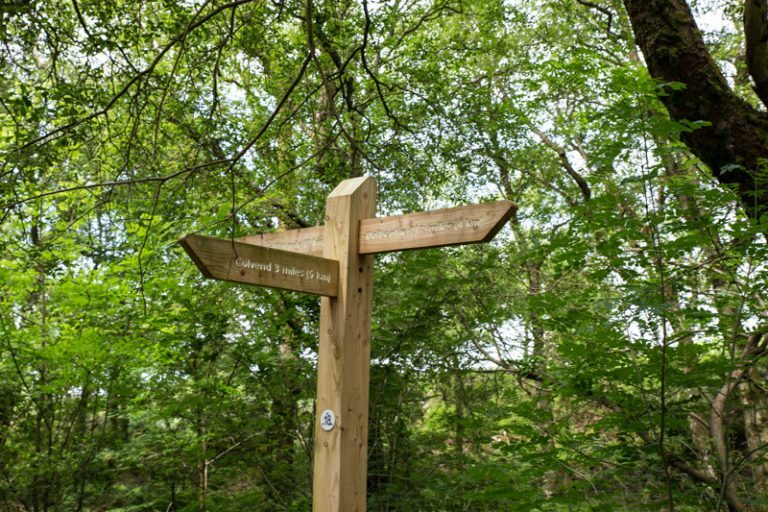 We walked into Dalbeattie Forest, turning right as we did on Monday afternoon but this time we wanted to go all the way to Colvend and then carry on. The weather seemed less humid when we set off. It was bright and sunny and warm. 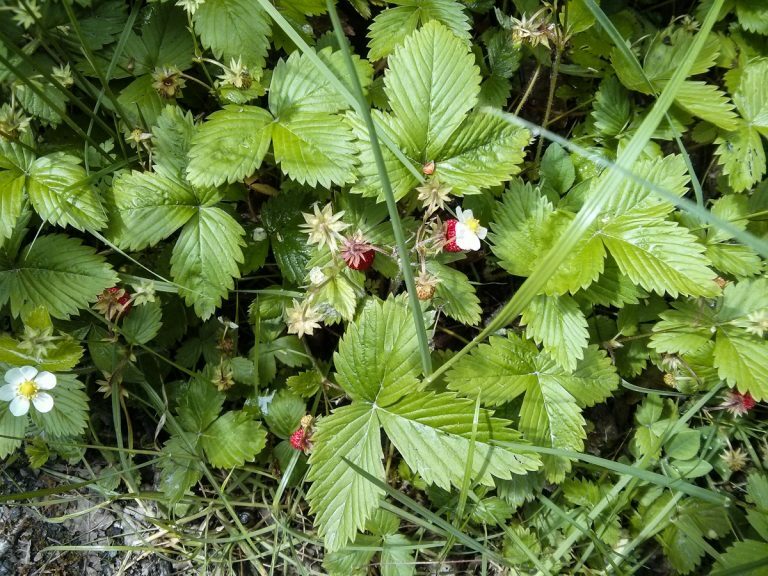 I found wild strawberries and dog roses. We paused for a water break at the side of a pretty loch. All seemed fairly well in my world. Do you think I can get a permit to fish here? As we left the forest path and came out onto a village track, I noticed a man with a petrol can in his hand.. I saw his car and recognised the private number plate as belonging to the site that we were staying on. I engaged him in conversation and he proved to be the site owner, visiting his off-site hideaway. He was very friendly and told us all about his plans to build a new house and landscape a garden. While we talked a Jay flew past on what was it seems a daily visit. It has been many years since I last saw a Jay (the last at Temple Newsam). We introduced ourselves as the couple enquiring about a seasonal pitch for the winter and he confirmed that we could have one and suggested a few pitch possibilities. We said goodbye and carried on. Colvend sports a small convenience store, I think it was a Cost Cutter. We did not go in because of Nell but it would appear to be of suitable size to furnish our daily needs and offers a much shorter walk from the site than the one into Dalbeattie. The bus stops outside if we should feel lazy for the return leg but the walk is moderate enough to do both ways on foot. I could even take my shopping trolley. Crossing the A710, we took the minor road down to Rockcliffe, which was lovely, passing an interesting-looking kirkyard duly noted for future photography. 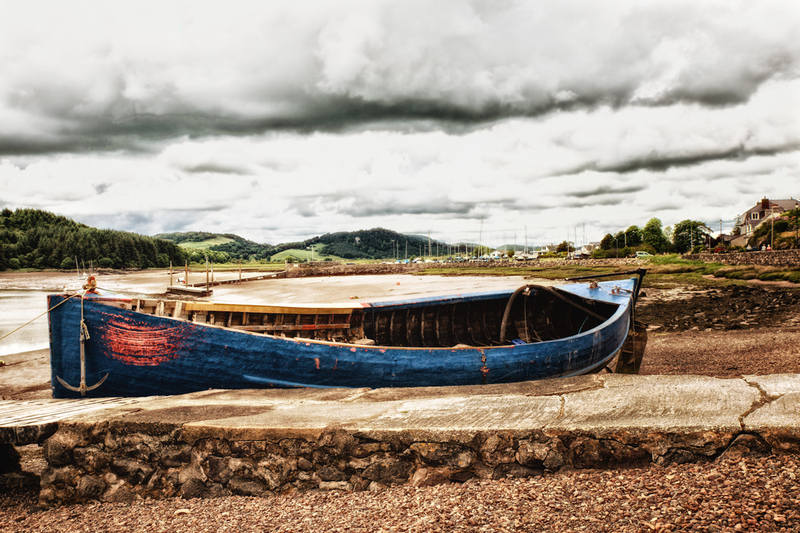 Rockcliffe is the kind of place where we would land up as kids, taken on a sea-side “treat” always to somewhere where it would be impossible to spend any money. A cheap day out. There was an ice-cream van in fact, but I had failed to pack any money. We had however learned our lesson from the Dalbeattie experience so were able to sit and eat our Tuna Mayo sandwiches while enjoying the view. 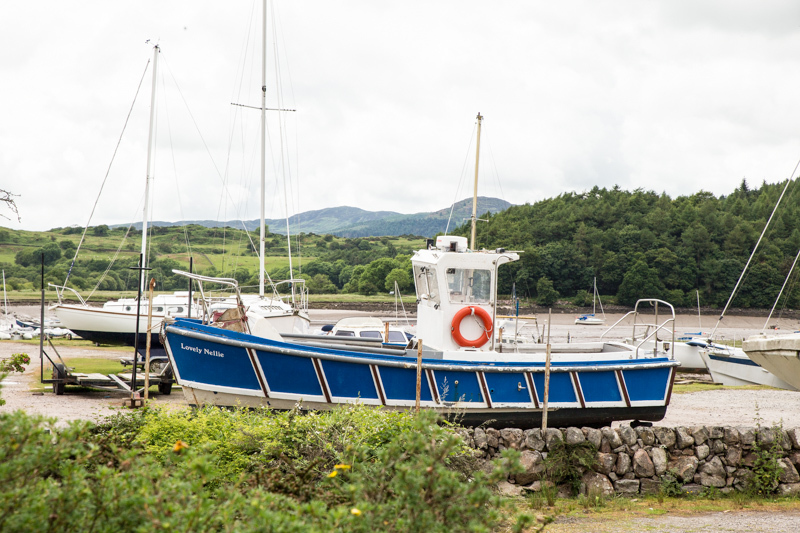 From Rockcliffe we took the Coastal Path to Kippford. The Coastal Path does not take in much of the coast but winds its way pleasantly enough across land maintained by the NTS, who are trying to tame the bracken and encourage the wild flowers to flourish in its place. 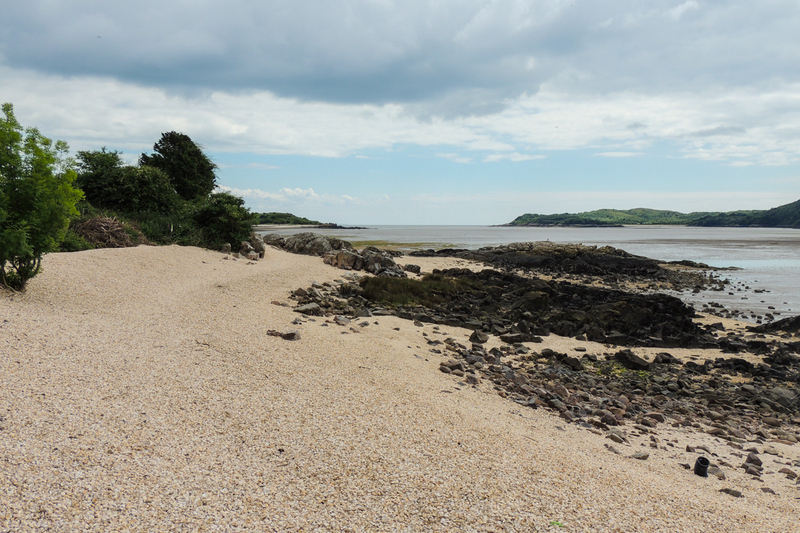 Back at the edge of Kippford I found an astonishing Cockleshell beach. Quite literally nothing but cockleshells as far as the eye could see. Around seven miles all told and brought our total for the three days up to somewhere approaching 30 miles. The use of the poles made this walk far easier and I had much less discomfort afterwards. All the same, I was quite pleased to think that I was now facing several days of travel and… sitting down! We spent some time during the evening in discussing Teddy, trying to decide if he was ill or simply showing his age. We decided to take him to the vet at the first opportunity after we arrived home.